Common Question: How to Control Rabbits, Moles & Deer? Research done on agricultural crops in Amsterdam showed that plants sprayed with Tabasco sauce at 1 oz. per gallon of water was effective at repelling rabbits. Here’s one Dirt Doctor listener report: So far the Tabasco in water spray is working great at keeping the rabbits away. I was very skeptical, but by this time last year, the rabbits had completely destroyed my large vegetable garden and had eaten all my pansies. My garden looks gorgeous. The verdict is still out on how the veggies taste because nothing has been harvested yet. But it has definitely kept the rabbits at bay! 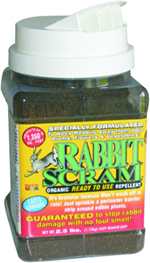 A commercial product for pest control that is available in stores is Rabbit Scram. Rather than a liquid spray, Rabbit Scram is a natural organic granular repellant that is effective and safe to use around children, pets and your vegetables. I’m very impressed that the owner of this company has applied a scientific approach to not only researching that the products work, but why they work as well. Rabbit Scram is different because it is more than just an offensive scent or unpleasant taste to foraging rabbits. It is blended from selected organic and natural components and is sniffed off the ground by foraging rabbits before they enter the garden. The product actually changes rabbit behavior. As they near the applied barrier, rabbits become alert to a sense of danger. Rabbit Scram’s unique scent triggers a genetic biological defense mechanism to flee from predators. Regular applications create a barrier 24 hours a day and won't wash off with rain as many spray repellents do. As opposed to Tabasco sauce, Rabbit Scram is guaranteed to keep rabbits off your plantings. We are very happy to be working with this company. They also provide Mole Scram and Deer Scram that have the same scientific effectiveness.